Toronto’s crack-smoking mayor Rob Ford has his problems, but Christmas shopping isn’t one of them. He said last month he intended to give his wife “a nice check,” and during an appearance today on Washington, D.C. sports radio, he said the plan had worked out fine: “I gave her a check for five grand, and she was really happy.” What did she get Ford? “She always buys me new ties and nice shirts and stuff … I’ve got tons of ties. Tons.” The domestic bliss, we believe. 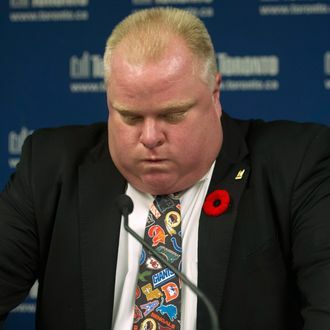 Ford’s tie selection? Needs work.